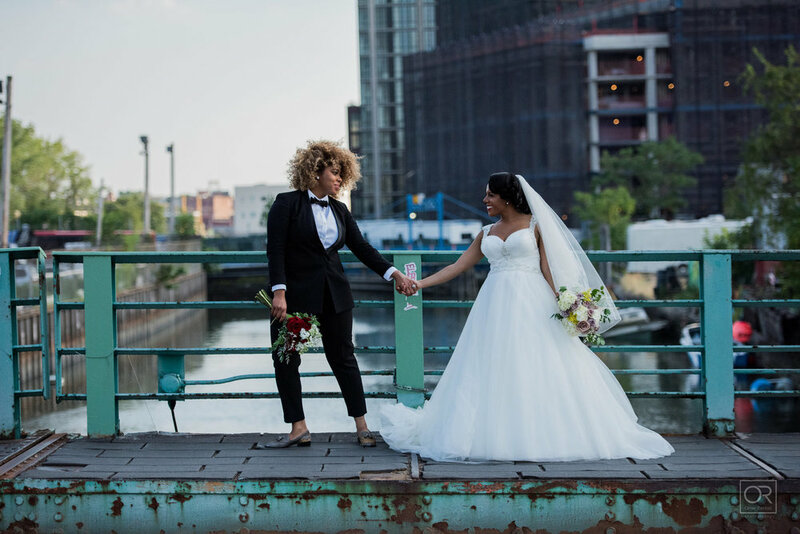 Wanna get hitched at the Green Building? Built in 1889, the Green Building was originally constructed as a brass foundry. It has since been restored into an elegant mixed-use event space with more than 6,000 square feet of combined indoor and outdoor space. 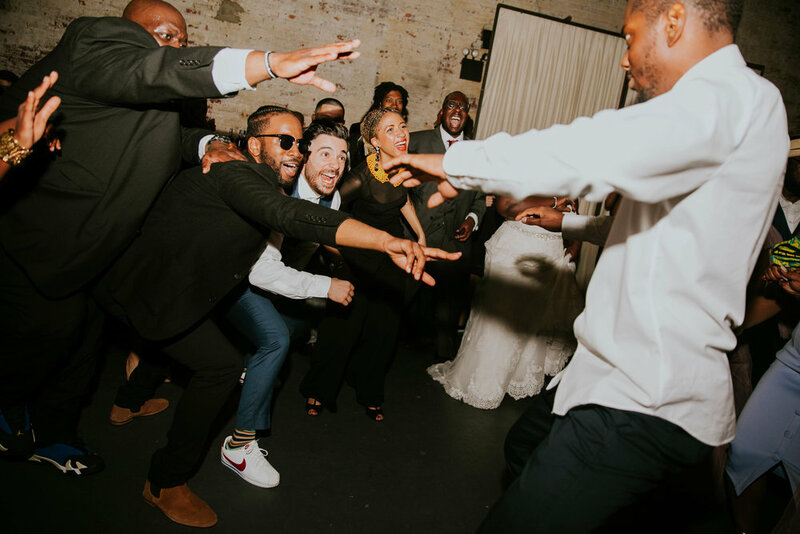 Renovations highlight the building’s industrial past; the venue’s original exposed brick walls, natural light, and open-beamed ceiling make a unique setting for your Brooklyn wedding. 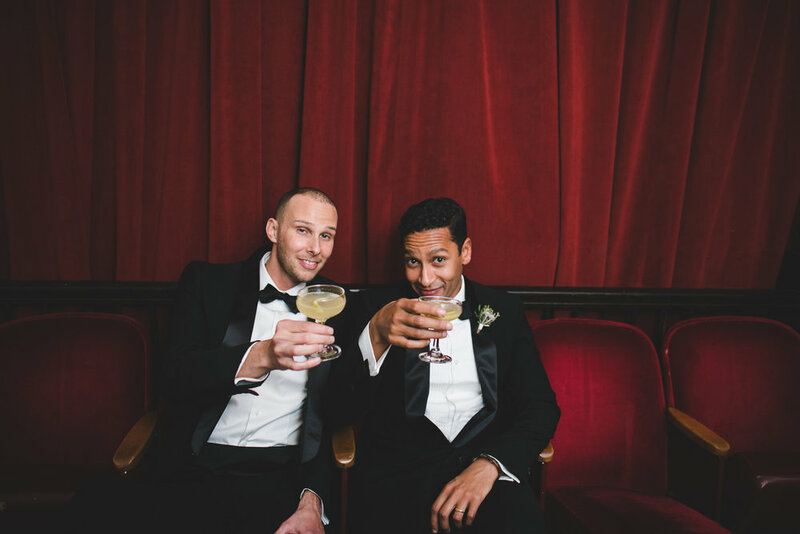 We’ve hosted over 500 weddings since opening our doors to our first couple in 2010: intimate gatherings and blowout bashes, Thursday night cocktail parties and Sunday afternoon brunches; Friday night ragers and Saturday black-tie, and everything in between! The elegant, understated beauty of our space allows you to dress it up as little or as much as you’d like. The following is a list of our preferred catering partners who have a history of creating stellar events at the Green Building. They know our venue intimately, provide amazing service, and of course…delicious food. What's the capacity of the Green Building? We can accommodate up to 250 guests for a cocktail party, 160 for a sit-down dinner with room for a dance floor. What's the rental fee for an event at the Green Building? Our rental rates vary based on the time of week and year. Please fill out our inquiry form detailing the nature of your event, estimated attendance, and timing, and we’ll get back to you as soon as possible. You may also call our office, Mon – Thurs 10 AM – 6 PM and Friday 10 AM – 3 PM, at 718.522.3363. 501 Union is our sister event space across the street from the Green Building. Do you have a kitchen onsite? The Green Building includes a 500 sq. ft kitchen featuring ample counter space, two (2) low-boy refrigerators, one (1) ice machine, one (1) three compartment sink, recycling bins and trash cans. There are eight outlets on separate 20-amp breakers and one outlet on a 60-amp breaker. There is a separate service entrance into the kitchen from Union Street as well as an outdoor prep area for catering grills, smokers and deep-frying. Caterers may opt to bring in additional cooking equipment. Please check with your venue coordinator for any restrictions. Who is onsite the day of the event? The Green Building will clean the space before and after your event: sweeping, mopping, detailing the bathroom, and taking care of any necessary repairs. All centerpieces, candles, and additional decor must be removed from tables, neatly packed away, and consolidated in the kitchen or foyer. You may store personal belongings overnight, but must arrange for pick-up no later than 11 AM the following morning. Linens must be bundled and tied, or bagged and consolidated with outside rentals. Tables and chairs must be folded and stacked against one wall in the main space. Green Building furniture rentals must be separated from outside rentals when applicable. Glasses, dishes, food, drinks and personal items removed from lounge area. All glasses, plates, silver, etc. back in their original crates, consolidated in the kitchen. Food and drink removed from kitchen. Removal of all signage, floral arrangements, candles, and other items provided brought into the venue for your event from the bar. Break down all boxes, bag all trash and remove from kitchen through rear emergency exit. Green Building staff will provide large format receptacle. Yes, use of our 2400 sq. ft. courtyard, room for up to 200 guests standing, is included in your rental. Please note, the courtyard is closed in the months of January, February, and March. Up to five (5) wooden “Schweiger” tables with chairs, up to four (4) mosaic tile tables with chairs and one (1) mobile outdoor bar with an additional 6 ft. banquet table are included in rental. Set up of any additional furniture or decor may commence at 9AM on event date and breakdown must begin at 12AM that evening. The Green Building has an 18’ x 30’ a-frame canopy available for rental, which may be rented up to 72 hours prior to the scheduled event. We recommend our canopy for light rain. Do keep in mind that is only covers 18’ x 30’ of the 30’ x 80’ courtyard. If you would like to cover the full courtyard, we are happy to recommend a few tent companies for your needs. Do you provide heaters for the courtyard? No, but you are more than welcome to rent heaters from a tent company. Am I able to have a fire pit in the courtyard? If you are interested in having a fire pit in the courtyard, it must be rented through The Green Building. Included in our fire pit rental is one (1) outdoor fire pit for four (4) hours, four (4) benches, two (2) bushels of wood, one (1) fire extinguisher, and onsite staff member. Are there any noise restrictions for the courtyard? All music must end by at 10pm and courtyard access ends at 12am. No amplified bands are permitted in the courtyard. A 50% deposit of the rental fee is due at the time of booking. In addition, we require a $500 security deposit, which is refunded 10-15 business days after the event, provided there are no damages. The remaining balance is due 30 days before the event. The Green Building accepts cash, check, money order, and all major credit cards (subject to a 3% processing fee). Street parking is available. There is also a QuikPark garage located at 365 Bond Street, which is approximately a four (4) minute walk from the venue. Should your guests need directions or a car service at the end of the evening, our host will happily assist. Local valet companies are also available for hire. Please inquire for more information. You and your vendors gain access to The Green Building at 9 AM on the day of your event. There is absolutely no smoking allowed inside. Smoking in the courtyard is left to the couple’s discretion. Yes, however all candles must be contained in votives. Open flames are not allowed anywhere in the building. No candles are allowed on the floor. Can I keep the large glass doors open during my event? Yes, but the doors must be closed by 10:00 pm to comply with NYC noise ordinance. Only a member of The Green Building staff may open or close these doors. We pride ourselves on being flexible and accommodating; you may use the vendors of your choice. The one exception is that rental items (i.e furniture, dishes, flatware, etc.) must be sourced through either The Green Building or Broadway Party Rentals. Is there a dressing area onsite? Yes. 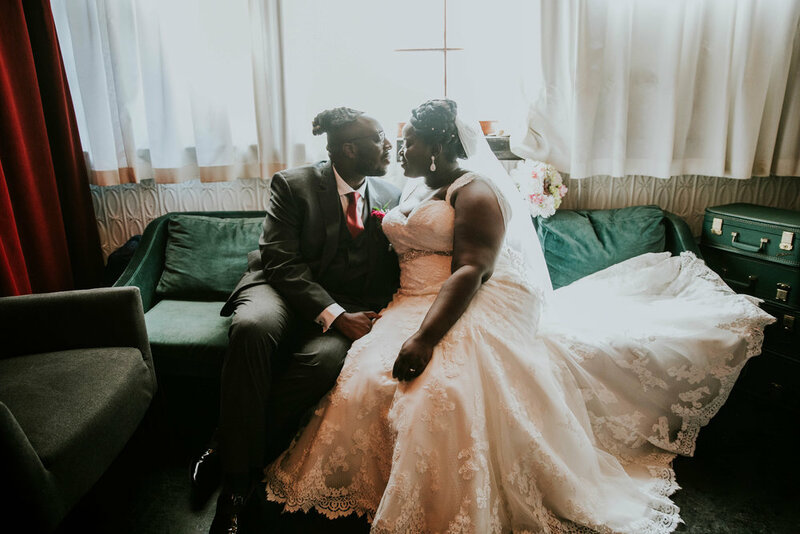 Many couples use our private lounge to relax with their wedding party before the main event, and some couples use it as a place to sneak away during the reception. There are many creative ways to use the space. We require you to provide a certificate of insurance that covers your vendors. Your caterer may be able to add your vendors as additional insured to their policy. We require $1M general aggregate / $1M per occurrence including property damage. We recommend privateeventinsurance.com or wedsafe.com. The policy will cost approximately $175 and can be purchased up to 24 hours before your event. Please have a copy of the policy sent directly to your private event manager. Four (4) individual, unisex washrooms, one (1) of which is wheelchair-accessible. Yes. A manager will be on-site during your event to answer any questions, provide general assistance and oversee the building and our staff, but he/she will not coordinate your event. Your caterer may be able to provide these services. Please also reference our preferred vendor list for a list of professionals familiar with our venue. All beverage service at the Green Building will be exclusively provided through our in-house bar program. There are several tiers and options to cater to the different needs of our clients. Our packages offer your guests a hand-selected assortment of local and popular options, as well as our expertise in service. Is The Green Building pet friendly? 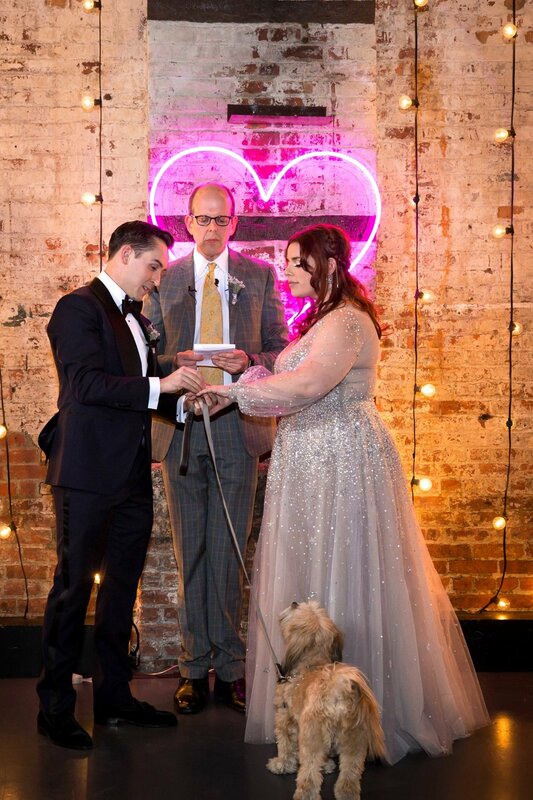 Well-behaved pets on leash are permitted in the space during the ceremony with prior approval. We kindly request that following the ceremony the pet be escorted home. While we love to host smaller events like showers, often the rental fee and size of the venue are not ideal for these types of events.